Thanks largely to the navigational skills of Gina Hammond and Ken Knapp, the So Others Might Eat (SOME) January group virtually glided into Wash- ington, DC despite the known perils of inaugural traffic. This is the third time in 30 years that we can recall our service coinciding with the transfer of power in our nation’s Capitol, but there were some concerns as this was the first since the terrorist attacks of 9/11 in 2001 and security was tight. We deviated from our normal route of the 14th Street Bridge and rounded the beltway all the way to Silver Spring with nary a car in sight, proceeding down Georgia Avenue, making every single green light practically until our arrival at O Street, NW. With much time to spare we learned upon arrival that the area shelters had been advised to keep their doors open all day and feed the guests on site rather than send them out for lunch to kitchens like SOME. This action was an effort to promote safety and crowd control, or so we were told. Despite the edict, we managed to feed close to 300 people our standard fish meal, beloved by all. Many views were heard about the incoming Administration as well as the outgoing and we managed to rise above the noise and get our meal on the table earlier than ever. Our group fed a blind father of two with children in tow, the handicapped, the elderly, the infirmed, the down- trodden as well a private dining room full of women. Our faith and mission to continue this program lies with these individuals and will respectfully continue, with the support of our ministry, the Outreach Committee and congregation, no matter who controls the White House. Rallying for the cause were: Bob Appenzeller, a true jack-of-all trades and our resident humorist; Ken Knapp, our fish cooker extraordinaire; Jim Gemmer, who cheerfully washed pots and pans and dishes the entire morning; Len Shapiro, the green bean master and driver; Margaret New, who braved Massachusetts Avenue traffic and joined us on the serving line, Gina Hammond, who bakes like a professional and knows her way around the city; Pat Reilly, who joined us both to prepare the rice and serve it; and the venerable and noble Ann MacLeod, who handed out plates and offered kind words to all our guests. Robin Keys roamed the dining room as usual. Previously in the Cox Hall kitchen, our cooks readily dis- patched with the chopping of some gargantuan carrots and other vegetables to assemble the rice casseroles. 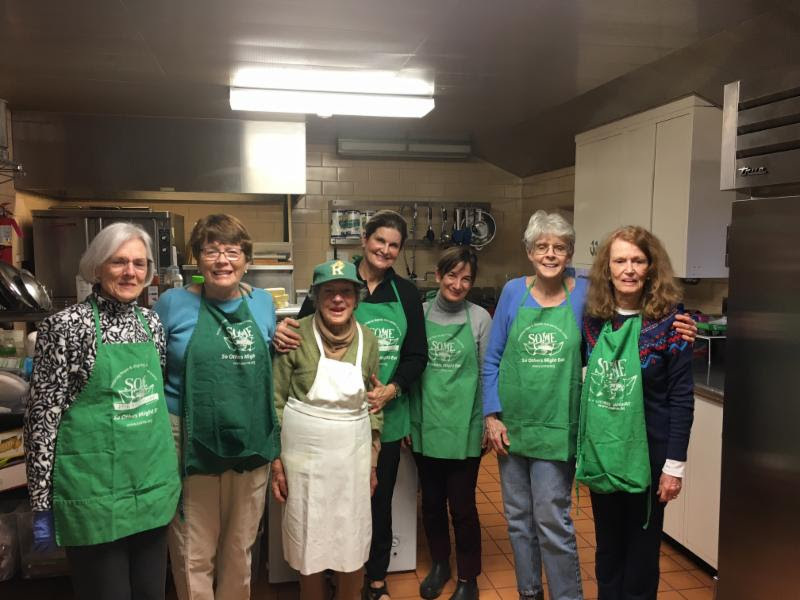 Please consider joining us on March 16 for cooking and on March 17 for a return trip to Washington to serve. We are also encouraged by your generosity in donating brownies, cookies and other treats and bread and muffins to accompany our meals. In March, consider providing goodies with a St. Patrick’s Day theme.